Dark Chocolate (Sugar, Chocolate Liquor, Cocoa Butter, Anhydrous Milk Fat, Soy Lecithin (an emulsifier), and Vanilla), Macadamia Nuts, Gum Arabic, Corn Syrup, Sugar, and Certified Confectioners Glaze (Food Grade Lac Resin). This product may also contain trace amounts of peanuts and other tree nuts. Contains: Macadamia Nuts, Milk, and Soy Ingredients. Although I ordered this item for five recipients on our Christmas list so did not have the opportunity to sample it, I learned through both a neighbor and relatives that they were moist, fresh and decadent ... in other words, well received. I would like to add that the gentleman who took my orders for gifts was extremely professional, courteous and determined to make certain that every last detail was correct. I could not have been more pleased with the outcome of my first experience with Superior Nut Company. Eminently suitable as a Christmas gift. Decadently delicious. 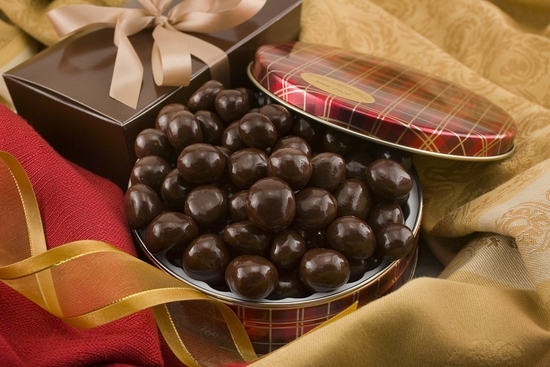 The Dark Chocolate Covered Macadamias are delicious. The rich Belgian chocolate combined with the slightly crunchy macadamias makes a delectable after meal treat.